How to move GTA V PC to a brand new Windows installation. Last week I installed a brand new Windows 10. Not an upgrade of a previous 8 or 7. So I lost all my programs. While most of other games run out of the box even if not re-installed (steam games, battle.net‘s etc), my 61 GB Grand Theft Auto V did not run anymore when clicked. But I really hoped to run it without re-installing it from scratch. Too big. So this is how I fixed it. Using Regedit and just moving some files. Hope this can help someone else as well. Boot and stay in windows 10. All these steps are done on windows 10 (the destination system) side. We assume your windows 7 GTA is/was up and running when on windows 7. I see my old windows with letter E:/ now. And the new windows 10 is on letter C:\ of course. First, take note where your Game is on now; in my case I installed it on an external hard drive which is now seen as letter D:\ so that I have D:\Program Files\Rockstar Games\Grand Theft Auto V (the 61GB size folder). There are 2 programs to fix, the game and the “social club” program. Both need to be fixed to run GTA V.
LET’S START – First, let’s fix the Social Club things. 1. From the old windows, copy the E:\Program Files\Rockerstar Games\Social Club folder to C:\ so to get the copy in C:\Program Files\Rockerstar Games\Social Club; each time give permission to read if asked. Create the \Rockstar Games\ folder too. In order to avoid losing the game progress, let’s copy the User’s profile too. This is under the old Windows’ document folder. 2. From the old windows, go into your C:\Users\YOURUSERNAME\ folder, then open Documents\, look for the Rockstar Games folder and copy it to the same position on C:\ This will preserve old games and profile unless you do want to start a new brand game. 3. Now run regedit.exe. Type it into the search windows input box and execute it. We need to create the missing keys for the game. Do the following steps. On the left side of regedit window, look for and Open HKEY_LOCAL_MACHINE, then open SOFTWARE then scroll down and open Wow6432Node, then scroll down to the R letter. Since it’s a new Windows installation, we do not find any Rockstar Games entry and this is normal. See the following screenshot. CLICK TO ZOOM. 4. We need to create the missing entries under Wow6432Node. So select Wow6432Node, right click on it, select NEW and select KEY from the submenu to create a new KEY called exactly (case sensitive) Rockstar Games. (check screenshots). At the end of the list your new entry will appear. 6. UNDER Grand Theft Auto V (as a son of its, so right click on it, do new and select key), add another new KEY called exactly “1.00.0000”, be sure to include the quotes, they are part of the key name! These entries will tell the game that it is installed and it exists somehow. Now we need to populate these entries with data values so that the game finds itself. 8. Click to select Grand Theft Auto V. On the right side of Regedit we can see the name <-> value relationships. There is only one when we created it and we are not touching that at all. We just add new entries. 9. It’s easier first to ADD all new KEY names, then editing them one by one to set the values we want in them. Right click on the right side to ADD these new NAME. Some have spaces in it, other don’t. Be sure to do exactly as written here. 10. Once all these names are added under Grand Theft Auto V right side panel of regedit, click on each of them and EDIT the current undefined value and set the following ones. Language type it-IT – if you installed an italian version (I did) or en-US for ENG. PatchVersion type 1.0.393.4 – note on August 15 my game was up to date to the latest available patch. You must obtain the following result. 12. Add the following names. 13. Click and edit the values with. When you do things in Regedit, they are saved automatically in Windows, so we’re done now and we can close Regedit. Have you Social Club user and password on hand since you’ll be now asked to enter them again in the GTA V Launcher, but the game will now work again as before. 14. 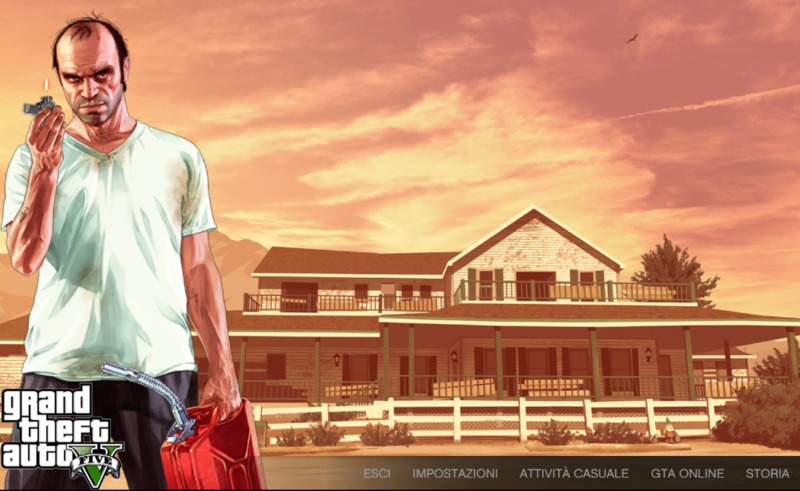 Head to D:\Program Files\Rockstar Games\Grand Theft Auto V\ folder and locate GTA LAUNCHER and double click it to run the game. We can also create a shortcut to it on the desktop since we don’t have any icon of the game in the Start Menu. Hope this post can help someone like me.